In the constant struggle to improve data quality it is common to avoid using free-text fields in favour of select fields. This approach has the advantage of ensuring that data is entered consistently such that it can easily be searched and reported upon. Option-Set Field - stored in the database as an integer value which is rendered in the user interface as a dropdown list. The labels can be translated into multiple languages depending on the user's language selection. Lookup Field - a search field that is stored in the database as a GUID ID reference to another entity record. The Lookup field can only search a single entity type. Number of items in list – The larger the list and the likelihood that it will grow, the more this becomes important. Filtering based on user's business unit - This is especially important where you have different values that apply to different parts of the business and so the list of options must be trimmed to suit. Adding new Items - Ease of adding values frequently by business users. Removing values – Ease of removing values without affecting existing records that are linked to those values. Dependant/Filtered options - This is important where you have one select field that is used to filter another such as country/city pairs. Additional information stored against each option - This is important if you have information that you need to store about the selected item such as the ISO code of a country. Mapping between entities - Is the option on multiple entity types? Often the same list of items is added as a field in multiple places and multiple entities. This can be important when using workflows/attribute maps to copy values between different entity types. Number of select fields - The more select fields you have across all your entities, the more important this becomes. Filters, Reports and Advanced Find - When creating advanced finds and views, a user should be able to select from a list of values rather than type free text. Configure once, deploy everywhere – One key design goal should be that once a field is configured, it should be easily used across the web, outlook, tablet and phone clients. Option-Sets are the default starting point for select fields. No more than ~100 for performance reasons. All items are downloaded into the user interface which will cause performance problems for large lists – especially where there are lots of option-sets on the same form. Option-Sets require a metadata configuration change and a re-publish that would usually be done out of hours by an administrator. It is best practice to do this on a development environment and then import a solution into production. Adding new values to the list isn't something that can be done by business users. Each option-set item can be translated into multiple languages. If you need to have the select field multi-language then an option-set is probably your best choice unless it is going to be a long list, in which case you'll need to make a compromise. It is not possible to store additional data other than the label and integer value of the option-set. You would need to store somewhere else in a lookup table format. Use a global option-set that can be defined once and used by multiple option-set fields. You can have as many select fields as your entity forms will allow. The more fields you have the slower the form will load and save. Option-sets are always presented as a drop down in advanced fine and view filters. Works across all clients including phone and tablet native apps. 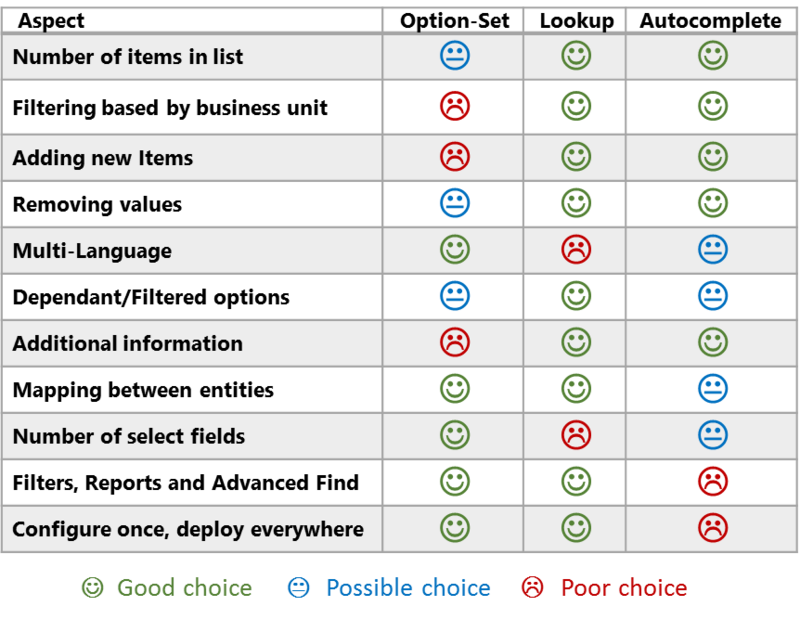 Option-sets are the most 'native' choice for select fields and will work in all deployment types without much consideration. Lookup fields allow selecting a single reference to a custom entity using a free text search. Unlimited list items subject to database size. Since all list items are not downloaded to the user interface (unlike option-sets) the user can search quickly for the item they need. Security Roles can be used in combination with a user owned lookup entity so that lookup records are visible to subset of users. Read about how Security Roles can restrict access to records. New records can easily be added by users using the 'Add New' link. Control over who can add new items can be done using Security Roles. If you need business users to add values regularly then a Lookup field is a good choice. The Configuration Migration tool in the SDK can be used to easily move values between environments. Old items can be easily deactivated and will no longer show in lookup fields (including in advanced finds) however existing records will retain their selected value (unlike when option-set items are removed). If you need to make changes constantly to the list and remove items without affecting previous records then a lookup field is most likely your best choice. Not possible without complex plugin server side code to dynamically return the name in the current user's language. Read my post on creating multi-language lookups. Lookups are the easiest and quickest to setup dependant lists without writing code. This filtering will also work on tablet/mobile clients without further consideration. Additional information can be stored as attributes on the lookup entity records. Lookup views can show up to 2 additional attributes within the inline lookup control. If you are integrating with another system that requires a special foreign key to be provided, lookup entities are good way of storing this key. Lookups can easily be mapped between records using attribute maps/workflows or calculated fields. CRM Online is limited to 300 custom entities. This is an important consideration and it's unlikely to be a good idea to use Lookup entities for all of your select fields. If you are using CRM online you'll likely have to always use a combination of lookups and option-sets due to the limit of 300 custom entities. Don't take the decision to make all your select fields as lookups. Lookups are presented as search fields in Advanced Find and Filters. Works across all clients including phone and tablet native apps. If working offline however, all lookup values may not be available. An autocomplete field can only show as many items as you return at a time but you'll want to put a limit for performance reasons. If you need the select field to be more like a combo-box where users can type their own values or select from predefined items then autocomplete text fields are a good choice. Since the actual field is stored as a text field there is no issue with removing values. Existing data will still be preserved. If you use the autocomplete to search a custom entity you can store additional data as additional attributes. The autocomplete flyout can display multiple values for each result row. Autocomplete fields have the advantage that they can show an icon that is specific to the record (e.g. The flag of the country). If you need this feature, then Auto completes are a good choice. If you use a free text autocomplete it's advisable to additionally populate a backing lookup field to facilitate searching/filtering. This would also allow you to ensure that 'unresolved' values cannot be saved by using an OnSave event to check that the text field matches a hidden lookup field that is populated in the OnChange event. Autocomplete does not work on phone/tablet native apps yet.